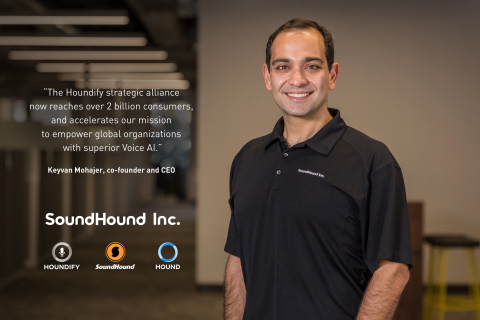 SANTA CLARA, Calif.--(BUSINESS WIRE)--SoundHound Inc.®, the leading innovator in voice-enabled AI and conversational intelligence technologies, today announced $100 million in new funding from a group of strategic investors. Participants in the round include Tencent Holdings Limited, Daimler AG, Hyundai Motor Company, Midea Group, and Orange S.A. These companies join SoundHound Inc.’s existing list of strategic investors including Samsung, NVIDIA, KT Corporation, HTC, NAVER, LINE, Nomura, Sompo Japan Nipponkoa, and Recruit. This combined group reaches over 2 billion users globally. SoundHound Inc. will use the new funding to drive adoption and distribution of its Houndify™ voice AI platform across verticals including automotive, Internet of Things, consumer products, and enterprise apps and services. The funding will accelerate global expansion, including new offices in China, France and Germany, in addition to furthering momentum in the US, Japan, and South Korea. Houndify is the only independent AI platform that allows developers and businesses to deploy a conversational interface while maintaining control of their brand and users. That control has become an increasingly important factor as companies risk disintermediation if they integrate with technology companies that have popularized their own voice assistants. In addition, Houndify's comprehensive set of technologies and capabilities results in the most advanced and scalable voice AI available in the market for product integration. This includes the world’s fastest speech recognition, the most sophisticated natural language understanding, easy to use developer tools, knowledge graphs, and a large and growing number of domains. Domains are programs that provide a natural and fully conversational interface on specific topics, such as weather, sports, flights, restaurants and many more, that can be readily enabled in any product without requiring users to memorize and use the specific phrasing of hard-coded commands or skills. Houndify technologies represent more than a decade of R&D and innovation by SoundHound Inc., resulting in unique advantages, making it the smartest and most accurate voice AI platform in the market. SoundHound Inc.’s patented Speech-to-Meaning™ and Deep Meaning Understanding™ technologies deliver unprecedented speed and accuracy in voice recognition and responses, and an ability to understand context, such as the user's location or previous queries, to support natural interactions. Another key advantage of Houndify is its architecture for collaborative intelligence called “Collective AI,” a powerful mechanism that facilitates collaboration among developers by enabling them to extend the functionality of existing knowledge domains. This results in a global AI with comprehensive knowledge that is always learning, is crowdsourced to domain experts, and is larger than the sum of its parts. More than 60,000 partners have registered on the Houndify platform since its launch in December 2015 and more than 1,000 distinct products are being powered by Houndify. At CES in January, SoundHound Inc. announced several integrations of its Houndify platform into various products, including a partnership with Hyundai in its Intelligent Personal Agent, a new voice-enabled virtual assistant system, in addition to integrations with HUMAX, BUNN, Mayfield Robotics, AvatarMind Robots, Modiface, PhotoSpring and Onkyo. The Houndify platform’s Collective AI architecture already provides access to knowledge and data from Yelp, Uber and Expedia, as well as over 100 other domains such as weather, stocks, sports, local businesses, flights, hotels, mortgage, and even interactive games. The platform also provides a large number of domains specifically targeted for the automotive industry. Houndify is featured in SoundHound Inc.’s mobile apps: Hound, the voice search & assistant app, and SoundHound, the music search, discovery and play app, making them hands-free and voice interface-enabled. Houndify supports other technology and service providers to make their offerings available to its large and growing developer community, such as its partnerships with Acapela Group and SELVAS AI, both of which allow users to incorporate more than 32 distinct text-to-speech solutions, in multiple languages, into their products or services. Developers interested in exploring the Houndify platform can visit Houndify.com to learn more and register. The Hound voice search and assistant app is available as a free iOS or Android app, and can be downloaded at SoundHound.com/Hound. SoundHound Inc. turns sound into understanding and actionable meaning. We believe in enabling humans to interact with the things around them in the same way we interact with each other: by speaking naturally to mobile phones, cars, TVs, music speakers, and every other part of the emerging ‘connected’ world. Our consumer product, Hound, leverages our Speech-to-Meaning™ and Deep Meaning Understanding™ technologies to create a groundbreaking smartphone experience, and is the first product to build on the Houndify platform. Our SoundHound product applies our technology to music, enabling people to discover, explore, and share the music around them, and even find the name of that song stuck in their heads by singing or humming. Through the Houndify platform, we aim to bring voice-enabled AI to everyone and enable others to build on top of it. We call this Collective AI. Our Mission: Houndify everything.